Southern yellow pine (SYP) lumber prices are at record highs. While this trend is benefitting southern sawmills, many timberland owners operating in the US South are asking the obvious question: Why are log prices in local markets not reflecting those of a surging lumber market? The answer to this question is not as straightforward as it may seem. While log prices are to some degree tied to lumber prices, the association is a loose one. There are a number of mutual factors that affect both lumber and log prices, but each market also has independent drivers that do not overlap, which is why we see a disconnect in the markets. What’s Driving Current Lumber Prices? 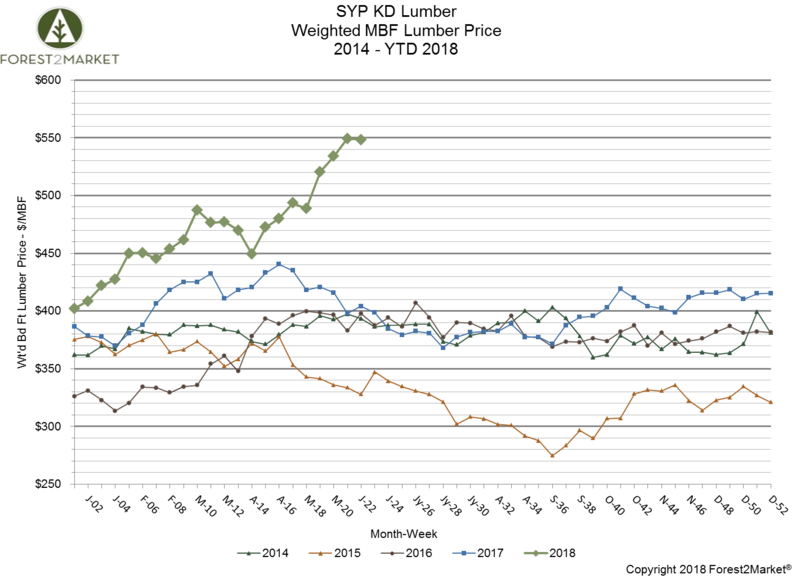 As noted above, southern yellow pine lumber prices have surged to record highs in 2018. Prices started out the year near $400/MBF and have since skyrocketed to nearly $550/MBF amid seasonal demand. The two primary factors that drive lumber price are housing starts and lumber inventory. 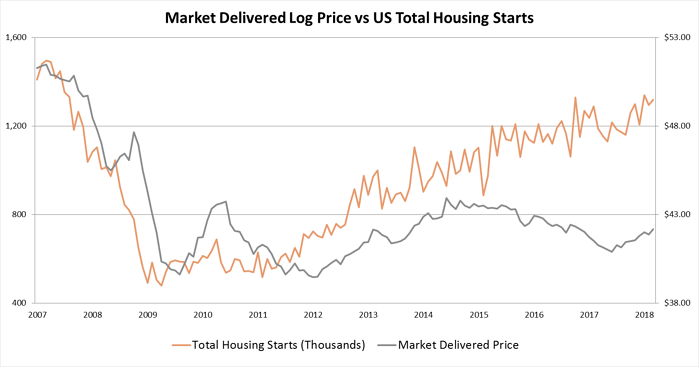 Housing starts: Historically, the main driver of SYP lumber prices has been the larger US housing market, which has experienced slow, continuous improvement since the great recession that began in 2007. Total starts are currently around a seasonally adjusted annual rate of 1.3 million units, which is slightly higher than the 1.2 million total starts of 2017. While there is still room for improvement (1.5 million starts is the historical average), demand remains strong as more millennials are transitioning into homeownership. Residential builders and developers are generally more cautious about overextending than they were pre-2007, which has resulted in a tight housing market and escalating prices. However, we expect to see steady growth in the housing market going forward. This will create sustainable levels of demand for lumber producers, and this kind of stability in the market will allow for mills to justify the large capital investments that will translate into additional demand for standing timber in the long run. Lumber inventory: The market’s capacity to produce lumber is the other key factor that drives price. Many mills were shuttered in the aftermath of the great recession as lumber demand all but disappeared. This correction in capacity has remained largely unchanged for several years. However, mills are currently scrambling to keep up with demand, which has resulted in tight inventories and upward price pressure. The southern sawmill industry is reacting, however. We continue to see large capital investments at facilities across the South, as well as new facility announcements and expansions from Canadian forest products companies. As more capacity comes online in the coming years, the inventory strain will likely diminish and allow lumber prices to settle. 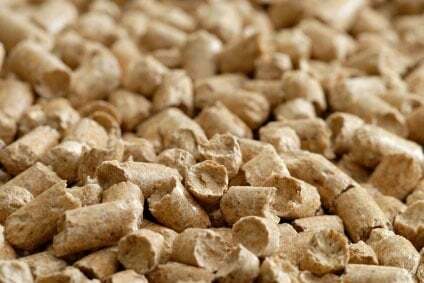 This added capacity will also help to reduce the large oversupply of standing timber throughout the region, and the surge in log consumption will slowly begin to affect prices at the mill gate and on the stump. What’s Driving Current Log Prices? The two primary factors that drive log prices at both the mill gate and on the stump are the general economic principles of supply and demand. Supply of logs (as standing timber): While many mills were forced to adapt and improve efficiences in the immediate aftermath of the great recession, many landowners simply pulled their timber off the market in hopes of driving prices higher in the future. This combination has caused the total volume of logs on the stump throughout the US South to rise unimpeded for the last decade. This oversupply combined with improved mill efficencies is keeping log prices low, even as demand for lumber and sawmill production increases amid an improving housing market. Demand from mills: Over the last decade, demand from mills has not tracked with the rising demand for lumber. During the years immediately following the great recession, the surviving mills became much more efficient at sawing timber, which ultimately allowed them to use less wood in the lumber-producing process. These mills adapted to the market and learned to do more with less, which has kept log demand down despite an improving housing market. Pine log prices have remained pretty steady across the US South over the last decade. There was a slight uptick in prices during 2009/2010 that coincided with the first-time homebuyer housing tax credit policy, but log prices dropped again in 2011 before showing slight appreciation from 2012 to 2014. Are Higher Timber Prices on the Horizon? While the slowly-improving housing market has created increased year-over-year lumber demand, this increase has not translated into higher log prices. As noted above, this is primarily due to the continued oversupply of timber in the region as a result of the great recession. Other dynamics are also at work in the larger global lumber trade, namely Canada’s decreased capacity to influence the US market due to a reduction in annual allowable cuts and US tariffs on Canadian lumber imports. The increased capacity from existing mill upgrades and planned greenfield mills will undoubtedly help to close the gap between log and lumber prices, but it will take time to work through the enormous amount of standing timber volume throughout the US South. When looking at the entire southern region, there is unlikely to be any significant upward movement in log prices in the near term. However, the US South is the largest active wood basin in the world and the trend will not be representative of conditions in all corners of the region. While wood supply is a major factor when it comes to mill expansions or greenfield projects, it’s far from the only factor; labor pools/costs, competitive market dynamics, transportation conditions, haul distances, etc. are equally important considerations. In the coming years, geographic pockets of intense forest industry activity throughout the US South will experience increased competition, higher removal rates and significant timber price volatility as a result. Timberland owners in these areas will see their resource values surge. Procurement managers and project investors in these areas must maximize their supply chain efficiencies in order to maintain profits.